Trees, shrubs and flowers now grow round all that remains of the stronghold of a once powerful family, but the howling, boreal blasts that lashed its walls haven’t changed at all. If you happen to find yourself in the area on a cold winter’s night near Midwinter and hear hoof beats, for your sanity’s sake, cover your eyes and do not look upon the abomination as it passes. Each day, a new clue will be posted until someone names the location, providing the street address, city and state (or province/country if located outside the US) and an explanation as to how each clue applies to the location. If no one correctly names the location, the contest will end at midnight (Eastern time), Saturday, December 29, 2018. Please note, the contest ends at midnight in the Eastern Time Zone. If you live in a different time zone, please make adjustments so you will know what time it ends where you are. There doesn't seem to be much interest in this one. Is anyone trying to name it? I think that this one is probably in England. You and Madeline can probably figure it out better than anyone else. Y'all are both good at naming the ones in England. First, anyone who Googled the clues could have named this one. 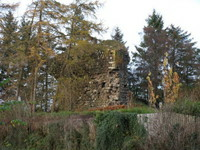 It is the remains of Elliston Castle, an ancient tower house, now a part of Clyde Muirshiel Regional Park, near Howwood in East Renfrewshire, Scotland. The castle once belonged to the powerful Semple clan, who later built Castle Semple nearby. Several members of the clan served as sheriff of Renfrewshire. Sheriffs in Scotland have a lot more authority and duties than those in the U.S.
During the month of December, the area is haunted by a screaming skeletal horseman riding a jet-black steed. The specter is said to be the demonic spirit of a 17th century cavalryman from the once corpse-covered moor at nearby Muirdykes Mount, where Scottish Covenanters and Jacobite Dragoons fought a bloody battle on June 18, 1685. The staring, hollow-eyed skeleton wears a bloody tunic and gore-drenched hat.